Everyone has their favourite bus route (yes, you do) but some bus routes are more thematic than others. We brought you 10 of our favourites recently, and here are nine more that have connections along their length. There are more good places to eat in London these days than even the most gluttonous of us will ever manage (and some of us sure will try). The 47 bus manages to hit up quite a few of them, with a definite emphasis on street food rather than fine dining. Model Market is open in Lewisham on Fridays and Saturdays from spring to autumn, or you can travel a bit further north to reach Street Feast's Hawker House at Canada Water. Closing in on Tower Bridge, get off at Abbey Street stop for Maltby Street Market. Open during the day on Saturdays and Sundays — during the rest of the week it's a salvage lumberyard — for stalls by the likes of African Volcano, The Cheese Truck and Maltby & Greek, plus a more permanent set-up from St John (with their bakery on nearby Druid Street) among others. 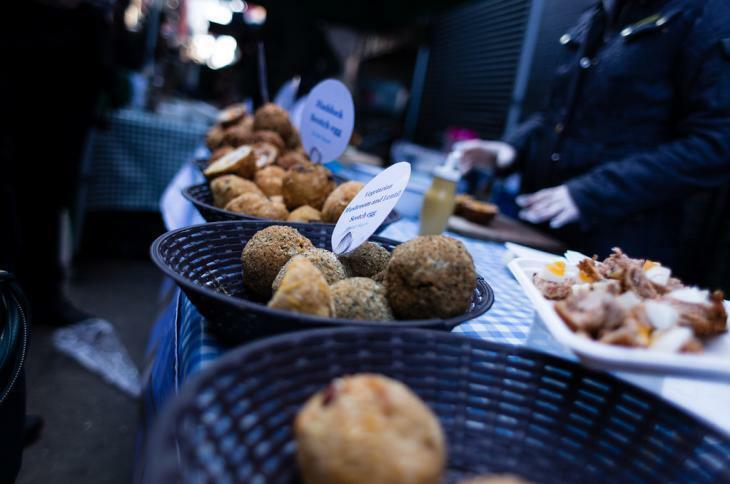 Scotch eggs at Maltby Street Market. Photo by Tom Jagot-Jarvis. A short hop further on brings you to the Daddy of them all: Borough Market. If you can't find something here to tickle your tastebuds, there's no hope for you. Annoyingly, while building work takes place along Tooley Street the route of the 47 is curtailed at Liverpool Street. Normally it goes up to Shoreditch, where you can enjoy another of Street Feast's outlets, Dinerama, but it's not that long a walk from Liverpool Street. And let's face it, you could do with working off some calories. As well as taking in some of London's most famous sights (Westminster Abbey, Houses of Parliament, St Paul's), the 11 is also pretty good for taking in some of the capital's major art centres. Starting off in Chelsea, where the Saatchi Gallery specialises in eye-catching exhibitions. It's occasionally shut between exhibitions, so if this happens check out some others on the King's Road: try Michael Hoppen for photography, Proud for music-related exhibitions or new gallery The Dot Project on nearby Fulham Road. 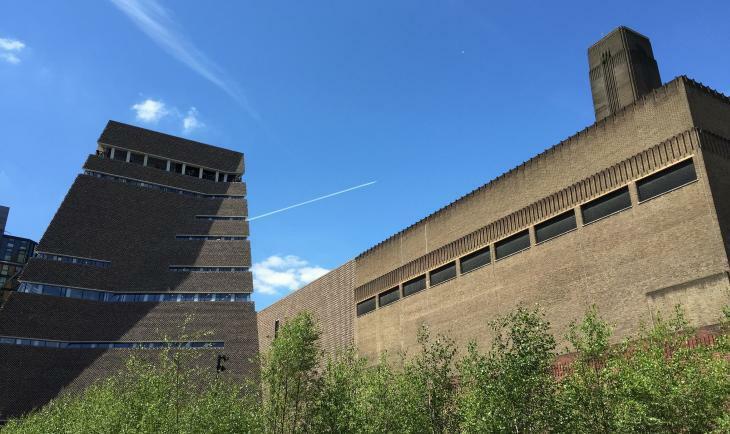 Tate Modern. Photo by M@. Get off in Trafalgar Square to admire the traditional public art and the Fourth Plinth, before heading into the National Gallery and National Portrait Gallery. Further down the Strand, there's always something worth checking out at Somerset House. As well as murals, carvings, statuary and mosaics, St Paul's Cathedral exhibits a small selection of modern art in its hallowed walls. But if it's just modern art you're after, walk over the Millennium Bridge for Tate Modern. Obviously, you can find pubs anywhere. The 68 takes in some of our favourites — and they all serve excellent booze. Just take it easy or you might not make it to the end. The Florence in Herne Hill has its own in-house brewery — A Head in a Hat, to be specific. There are also plenty of other fine ales on offer, but the pub can get very busy on weekends with families so bear that in mind. The Fox on the Hill in Denmark Hill is a Wetherspoon's, yes, but it knows its ale. Don't believe us? Take a look at this list. Then it's off into Camberwell for Stormbird, where it's possible to be stunned into inaction by the sheer range of beer on offer. Antic recently took over the prosaic pub in Elephant and Castle and turned it into a hip craft beer joint. There are five hand pumps, but nothing can change the view of the roundabout from the beer garden. The Euston Tap from the inside. Photo by Alan Perryman. Take to the Waterloo back streets and battle the inevitable crowds if you're there post-work for a pint of real ale at The King's Arms. Might be a good place to refuel with its inexpensive Thai food. Crossing the river brings us to the Holborn Whippet and its ever-changing roster of cask and keg craft beer. And then, as the bus terminates so must we — but what a place to finish. The Euston Tap, snugly smushed into one of the old station lodge buildings, has a vast selection of beers served from, appropriately, taps. Magic. We know there are plenty of football clubs around, but which bus route combines a wide selection of different sports to watch and also take part in? The 46, that's what. Start off at Lord's in St John's Wood for a spot of cricket (or just a tour if there isn't a match on). A leisure centre might not sound like a glamourous stop off, but Swiss Cottage has a climbing wall, full gym, football pitch and a decent pool, so it's worth a look. Hampstead Heath mixed bathing pond. Photo by Laura Nolte. 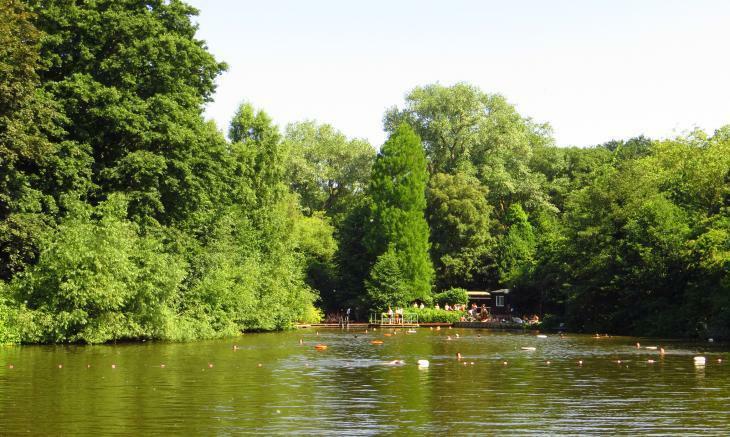 If you prefer your swimming outdoor and a bit nippy, Hampstead Heath's bathing ponds are your next port of call. Have a game of ping pong (and a drink) at Bounce in Farringdon, before heading to Urban Golf in Smithfield for a golf lesson or a simulated round. It's wallets at the ready for this journey on the 8, visiting lots of markets along the way. Roman Road Market in Bow has been running for over 150 years. You can pick up clothes and homewares, including end-of-the-line goods from French Connection, Top Shop and Made.com, as well as fabrics, toys and jewellery, while tucking into doughnuts and Caribbean chicken and rice. The market runs Tuesdays and Thursdays, and on Saturdays is joined by extra stalls near St Stephen's Road, selling vintage or designer-maker wares on alternating Saturdays, plus lots more food. 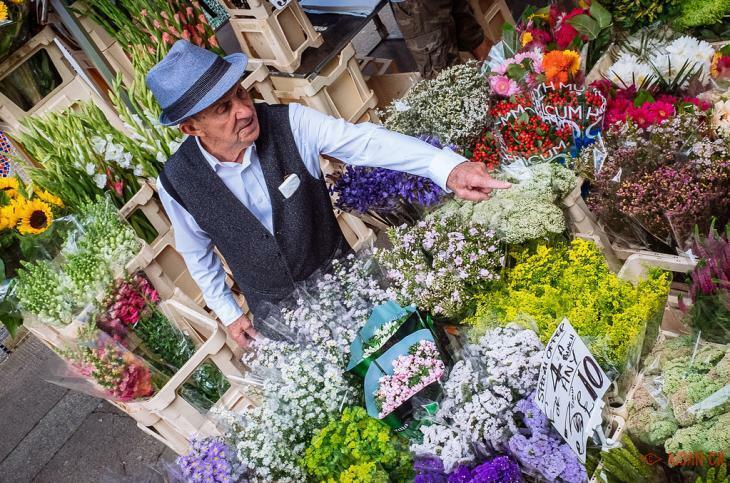 On Sundays, Columbia Road is transformed into a fragrant field by its flower market, but the road itself has plenty of interesting shops to investigate during the rest of the week. Brick Lane hosts a flea market on Sundays, too. Columbia Road flower market. Photo by Aidan_CK. Spitalfields may be London's oldest market but it's certainly moved on from its origins. You can find stalls every day under the Foster & Partners glass roof selling fashion, antiques, homewares, records, food and drink... Check out Spitalfields Market and Old Spitalfields Market websites for what's on when. From Spitalfields you can also head down to Petticoat Lane on Sundays for clothing and leather goods (note: not actually on Petticoat Lane). Smithfield Market is a stone's throw from the Holborn Circus stop, though be up with the lark: the range of meat is best before 7am, and it's only open weekdays. If you're hungry for something to eat on the go, head to the final stop at Tottenham Court Road and pick up a burrito (or souvlaki, or falafel, or salad, or waffles, or...) at Berwick Street Market. And of course, Covent Garden is just the other side of Charing Cross Road. There are a number of places to feel like you're in the country without leaving London, but we're taking you to Ruislip for a trip on the H13. Start off at Ruislip Lido with its beach (beach!) and miniature gauge railway, and learn about coppicing and making charcoal at the woodland centre. 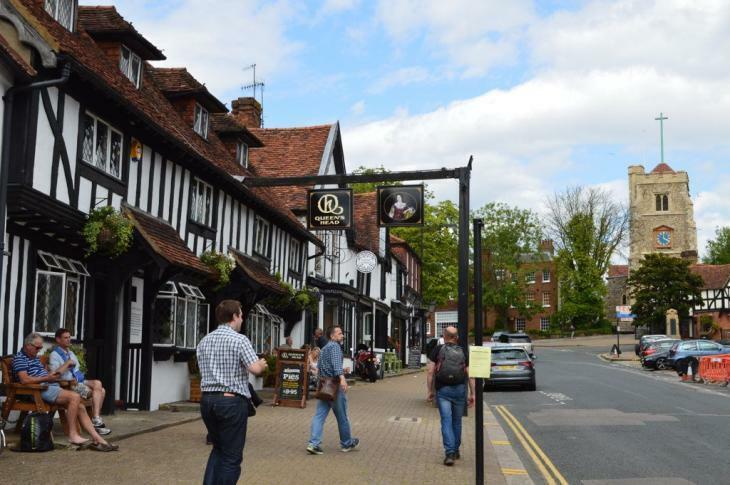 Get on the bus and head into Eastcote's conservation area, disembarking on the High Road for a trip to the 17th century building that houses the excellent Case is Altered pub. Relax in the garden, have lunch. Pinner High Street. Photo by M@. Back on the road, you pass open spaces like the Hogs Back, the charming Little Common and Memorial Park in Pinner with its lake and cafe, and the lovely High Street of Pinner itself. The end of the route is a mere stone's throw from the north end of Ruislip Lido and is a great starting point for exploring both Park Wood and Ruislip Woods nature reserve, which has remnants of the forest that covered the country at the end of the last Ice Age. Tricky one, this. What's a music tour without Islington's gig venues, or classical sounds at the Barbican or Royal Albert Hall? 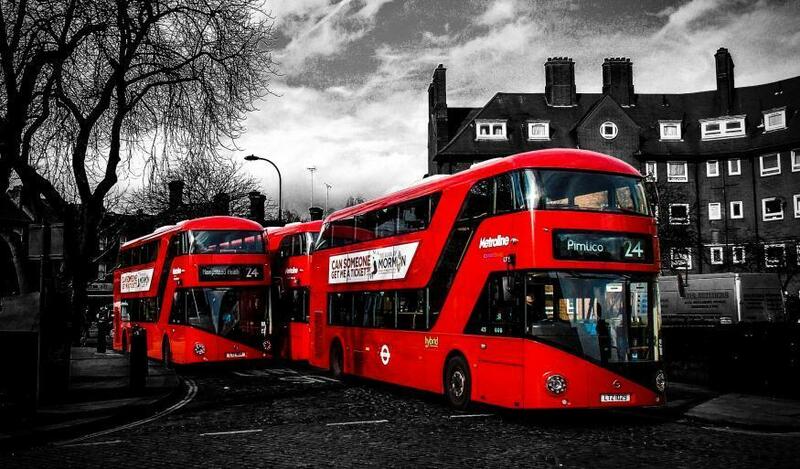 Until TfL sorts out a more comprehensively musical route, we're going with the 88. Start off in Camden for its plethora of gig venues and record shops (we've mapped our favourite record shops across London here, if you're interested). 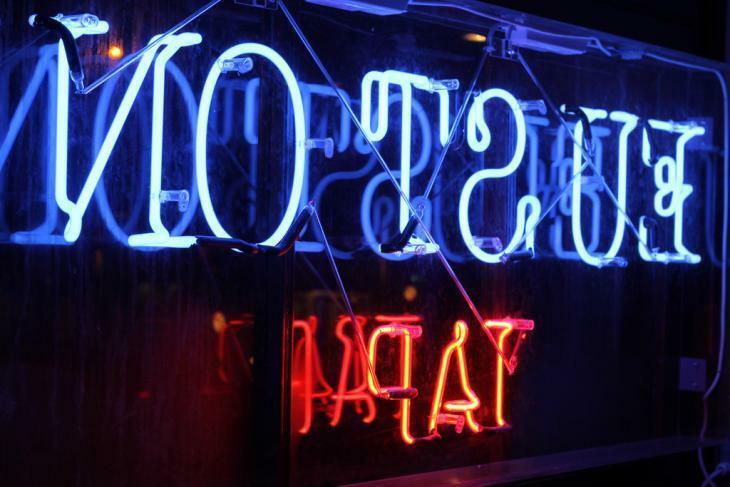 The Roundhouse and Barfly hold a special place in our hearts, but your mileage may vary. The 88 also stops outside Koko, if you can't be bothered to walk a couple of hundred metres. You could get off at Warren Street and walk over to Scala for a gig, but it's a bit out of the way. Instead, we suggest staying onboard until Tottenham Court Road and checking out Denmark Street. It's not what it once was (thanks, Crossrail) but it's still got a concentration of instrument shops. While you're here, go to Soho to browse more record shops. You can hear classical concerts at St Martin in the Fields in Trafalgar Square, sometimes by candlelight, often free at lunchtime. By this time you're probably ready for something a bit louder and sweatier. Lightbox and Fire are both a stone's throw from Vauxhall bus station for some house and techno. Or near the end of the line, get off at Clapham North and walk 20 minutes to the Brixton Academy for live gigs. If you just want hills you could try the C11 for Parliament Hill and Hampstead Heath, or the 202 for Crystal Palace and Blackheath/Greenwich Park, but we think the 176 is more fun. Yes, we start with a hill at the Horniman Museum in Forest Hill. But with views over the City like this, can you blame us? The view from the Horniman Museum. Photo by _NiKiri_. 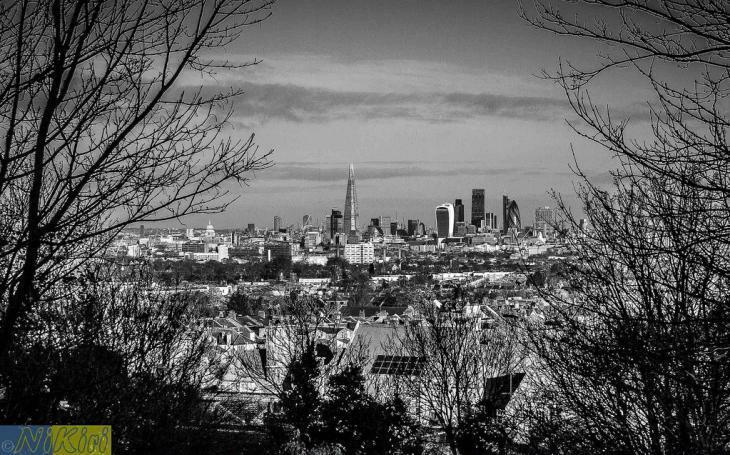 You can get glimpses of skyscraper from the top deck of the bus as you trundle on into town, stopping at the Fox on the Hill in Denmark Hill again for a pint and another view. Don't just take our word for it — the chaps at Deserter concur. Rolling into Waterloo, get off for a trip on the London Eye and round things off with a cocktail at Vista overlooking Trafalgar Square (take your wallet, there's a minimum spend and, from 4pm, a cover charge). We're not averse to London's major cultural institutions, but sometimes it's nice to get slightly off the beaten track. You can do that very handily with the 168. Within reach of the 168's northern terminus are two excellent Hampstead museums: Erno Goldfinger's former home at 2 Willow Road, filled with furniture of his own design and art by Bridget Riley and Henry Moore, among others. Go a couple of centuries further back in time at Keats House, all about the eponymous poet. Get off at the Rosslyn Hill stop for a 15 minute detour to the Freud Museum, which is dedicated to psychoanalysis and recreates Sigmund's study. 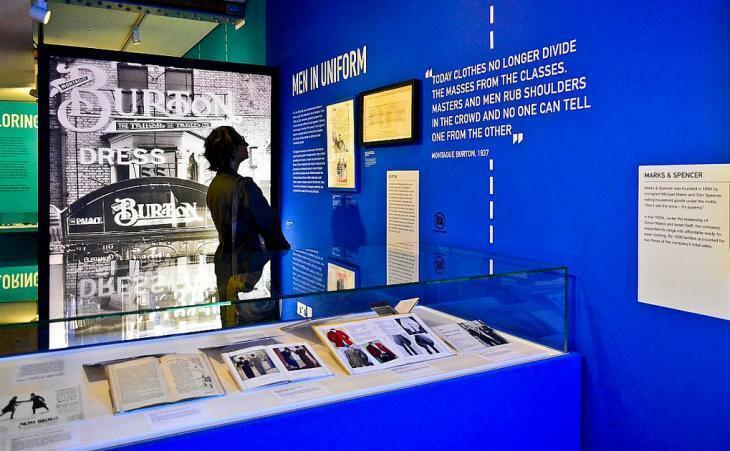 Near Camden Town station you'll find the Jewish Museum, which is dedicated to the history and heritage of Jews in Britain for the last 1,000 years. There are generally a couple of temporary exhibitions on alongside the permanent collection. An exhibition at the Jewish Museum. Photo by Andrea Liu. From Euston Road you can explore UCL's museums — the Grant Museum of Zoology, Petrie Museum of Egyptian Archaeology and the Art Museum. While you're here, don't forget to pop into the Wellcome Collection. It's fairly well known, but too good to miss. Do not go to the British Museum. That's not why we're here. Is Sir John Soane's Museum lesser known these days? Judging by the queues to get in, probably not. Why not visit the Hunterian instead, at the opposite side of Lincoln Inn's Fields, before it closes for three years? The National Theatre has its archive on The Cut. Missed a performance? Make an appointment and you can view a recording and take a look at programmes, prompt books and day-by-day notes. No, it's not really a museum but it's still worth a look. A few minutes' walk from Elephant and Castle is the Cinema Museum, celebrating cinemas themselves and associated ephemera. It's got a screening room of its own, too.